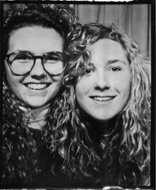 My first memory of a photobooth is from infrequent trips my family made to The Northpark Mall in Joplin, Missouri -- a 45-minute drive from my hometown of Monett. Outside the mall's movie theater stood a lone photobooth. I don't recall ever taking any photos in the booth, but I certainly knew it was there. In middle school I worked as a paper boy. I put my first year's earnings toward the purchase of an SLR camera, a Minolta X-700. I took a class from the local portrait photographer, read what I could get my hands on, and prevailed upon my uncle Joe to teach me how to use the dusty darkroom equipment he had in his basement. I'm not sure what drew me to photography or why a camera was my first major purchase, but I think Magnum PI had something to do with it. Thomas Magnum would hang out in the red glow of his darkroom to solve crimes. I think I hoped my camera would give me a leg up in my eventual career as a private eye. Sometime in middle school, on one of the family outings to the shopping mall, I stumbled across a misplaced photostrip. I picked it up and it made me blush. The two figures in the photo looked like the people I would see at the skating rink when I was little -- the ones who were really good at limbo. And they were doing what the good skaters did at the skating rink: they were making out. I did what any law-abiding, well-behaved, honest 7th grader would do: I stuck it in my wallet for my own comedic purposes. In high school I continued using my camera as often as I could. When I was a freshman and my brother Pat was a senior, we started dating a pair of sisters. It so happened their father was a talented and accomplished art photographer. That Christmas, the sisters gave each of us a matted photograph their father had created, as well as a single frame from a photostrip they had taken together. I remember being struck by the clarity and tone of the photo. I still have it. In college, I studied computer science, but I consumed as many art courses as my schedule would allow. On a summer visit to New York City, I happened on a single photostrip credited to Andy Warhol hanging in the MOMA. It was a standard 4-headshot strip of a woman (Holly Solomon). I recall being fascinated (and a little incensed) that a seemingly mundane photobooth photo was deemed museum-worthy. At the time, I didn't understand Warhol's relationship to the booth, or how well it dovetailed with some of his recurring artistic themes. But as a result of my unenlightened indignation, I began pondering ways to make a photobooth photo more interesting. This excercise led to me fill a page with photostrip sketches, then file them away. My original plan was to collaborate with my brother Pat and produce these imagined photostrips during our summer together. However, it wasn't until my senior year that the sketches came out of the file cabinet. I proposed them as my final project for a photography course I was taking at the Rhode Island School of Design. I located a photobooth in the lobby of the Boston Children's Museum, and few months of Bonanza bus fares later, all of the sketches had been produced and collected in a hand-bound book entitled Filmstrips: Booth Photography by Tim Garrett. In the ensuing years, I continued to make art in booths as I encountered them, but it wasn't until 2002 that I renewed my efforts with greater focus. That year, I got engaged, and we included some photobooth imagery in our wedding invitation. After completing the invitations, it occurred to me that a photobooth would be a fantastic addition to our wedding reception: guests could take photos with old friends and family, and we could create a visual guestbook of all attendees. Unfortunately, the photobooth rental industry didn't exist yet. I called everyone I could think of who might rent me a booth: arcade owners, travelling carnivals, antique dealers -- I called all over the country and I found no one. I was told over and over that the booths "weren't made for that kind of thing". In a moment of desperation, and with the kind assistance of George Grostern, I purchased my very own vintage black and white photobooth from Autophoto Canada. It arrived two days before my wedding, and I stayed up most of the night before the big day trying to figure out how to mix the chemistry, adjust the machine, and get a photo to print. I got it working and the booth was a hit. Once all the wedding dust settled, I realized I had conveniently ended up with a photobooth that I could use whenever I wanted to make my art. In an effort to fund my artwork, I decided to start renting the booth out for parties and events. The rental idea became PhotoboothStL, and the work I created in my new booth culminated in a art opening at Mad Art Gallery in September of 2003. In 2005, Los Angeles-based film archivist Brian Meacham and I created photobooth.net, a web compendium for all things photobooth. There we track photobooth happenings around the globe and use it to promote photobooth awareness. We also organized the 2005 International Photobooth Convention in St. Louis, MO as well as the 2009 International Photobooth Convention in Chicago, IL, and most recently, the 2012 International Photobooth Convention in Los Angeles. In 2006, I was chosen by Boston University's Photographic Resource Center as one of 30 photographers to watch. I continue making art in the photobooth, and the rental business has grown into an industry. Photobooth rental companies now pepper the landscape. My recent photobooth artwork includes larger pieces that incorporate multiple (sometimes hundreds of) photostrips, as well as custom-built photobooths that function as art installations. I continue to be excited by this aged medium.